Katie on the other hand milks the exclusive BE WITH time for all it is worth. She loves it when Mom or Dad lay with her and talk a little, snuggle a little, look at her American Girl Doll, and listen to a Kids Christmas Musical on the CD player that she has requested… since October. I sort of feel good when she tries to pull me back as I try to leave. I think its because we both like to have a little quality BE WITH time. Looking at my kids and thinking about where we come from, it makes sense that a relational God would make people like you and me with a craving to BE WITH someone, anyone that would love and accept us. I mean, this BE WITH craving really took off in the cyber world of Facebook and Twitter. I know that probably most of you have requested some amazing Cell Phone for Christmas so you can have a REAL SOCIAL LIFE and text your friends. Now you can even skype or have “face time” on your iPad and video chat. I think this all has to do with a BE WITH FACTOR in all of us, and the truth is, you have all that, but get most satisfied when someone is actually WITH you. Actually PRESENT. In front of you. Face to Face. Real in person like. God created us to be relational beings. He set the BE WITH FACTOR inside of us. A craving for real relationship. How about that girlfriend or boyfriend of yours, or even a crush. It doesn’t satisfy you just to text him or her, you really want to BE WITH that person. If you really think about it, you are probably planning amazing moments in your head revolving around the next time you are going to actually BE WITH him or her. Maybe that is why you actually like school. You are a 6th grade guy that thinks he is in love with your Math teacher, and you are planning every moment just to BE WITH her as she teaches you addition subtraction. One word – TUTORING! It is funny, though, we lose that thought when it comes to knowing God. When we think about God, we tend to forget that he really just wanted to BE WITH His Creation. In the Garden of Eden, He walked and talked with Adam and Eve. Then sin separated us from God. I think sometimes, we think of Him watching us from afar and not really interested in our daily lives. That is where this amazing Christmas Story proves us wrong. THE GREATEST STORY EVER TOLD begins with a promise in the old Testament. There had been a hope throughout history that hinted about GOD BEING WITH US. So lets read out of Matthew and think about GOD BEING WITH US. 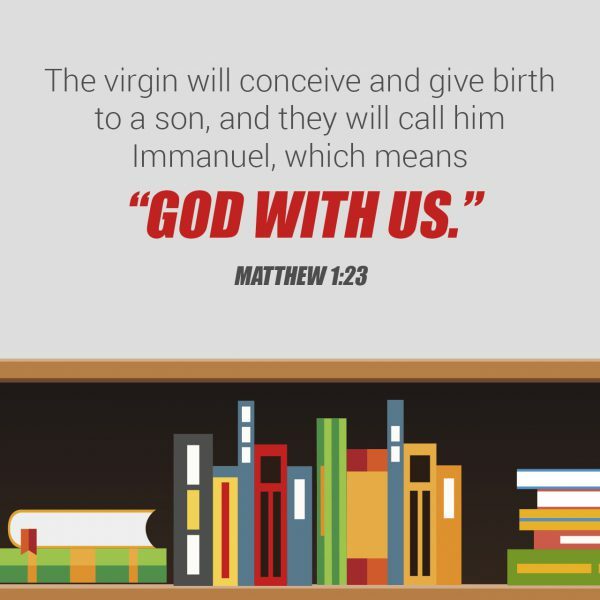 18 This is how the birth of Jesus Christ came about: His mother Mary was pledged to be married to Joseph, but before they came together, she was found to be with child through the Holy Spirit. 19 Because Joseph her husband was a righteous man and did not want to expose her to public disgrace, he had in mind to divorce her quietly. You see, Joseph was pledged to BE WITH Mary. Jewish laws. Mary and Joseph were betrothed. “engagement” period. Mary and Joseph did not live together, but their betrothal was an arrangement so binding, that it could not be ended except by divorce. When Joseph found out Mary was pregnant, the Oral Law gave him an additional option. He could have had Mary killed by stoning. Yet Scripture tells us that Mary was “highly favored!” Scripture says the Lord was with Mary . . . and the Lord was with Joseph. The presence of God enabled Joseph to believe and trust that the rules of his religion were to be submitted to the Author of his religion. GOD WANTS TO BE WITH US! When Sin Separated us from Him, he found a way to get reconnected again. He took on flesh, played by his own rules He created for mankind, and actually became a man, just to BE WITH US! Some day we will be in the New Heavens and New Earth and there will be the same relationship Adam & Eve had in the Garden. We will be God’s people and He will be our God. That is why it is the GREATEST STORY EVER TOLD! God made a way to redeem us by sending the Son of God. Born of a virgin. A king is Born. One that will rule over our lives forever, and He knows how we feel. So if God wants to BE WITH US, the question is do you want to BE WITH God? In other words – To BE WITH or NOT to BE WITH… THAT IS THE QUESTION! He pursued us in the most miraculous way. He wants us to have some exclusive time just talking about life, enjoying His Presence and enjoying the RELATIONSHIP. What do you desire for Christmas??? This Christmas novelty song was written by John Rox and performed by the ten year old Gayla Peevey in 1953. Peevey was a regional child star of the Oklahoma City area. When released nationally by Columbia Records, the song shot to the top of the charts and the city zoo acquired a baby hippo named Matilda. A popular legend holds that this 1953 hit had been recorded as a fund-raiser to bring the city zoo a hippo; but in a 2007 radio interview with Detroit-based WNIC radio station, Peevey clarified that the song was not originally recorded as a fundraiser. Instead, a local promoter picked up on the popularity of the song and Peevey’s local roots, and launched a campaign to present her with an actual hippopotamus on Christmas. The campaign succeeded, and she was presented with an actual hippopotamus, which she donated to the city zoo. The hippopotamus lived for nearly 50 years. Gayla Peevey later recorded as Jamie Horton, scoring the Billboard Hot 100 charter “My Little Marine” in 1960. This Christmas, Jesus wants to give you more than you desire. Fusion Will be back for the New Year!!!! Fusion Wednesdays Return January 9. We Jump back in to Fusion Sundays January 6 . WAY TO GO MIDDLE SCHOOLERS!!!!!! Fusion Oakwood Middle School is Celebrating Christmas @ Das Rec Wednesday, December 5. 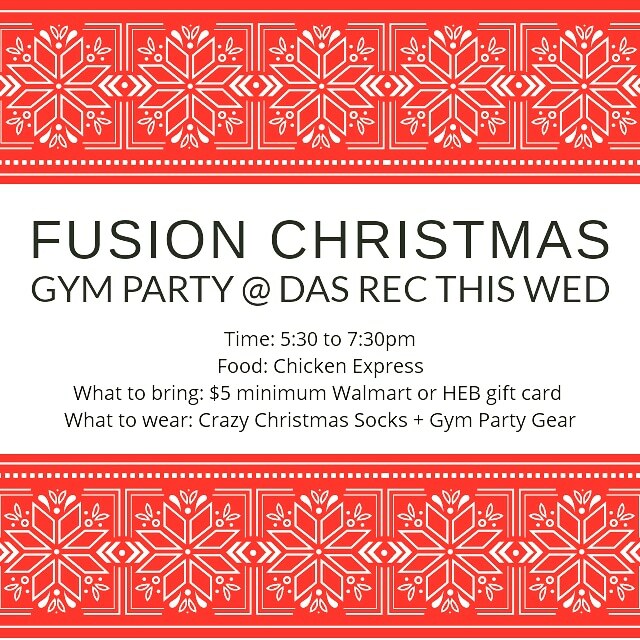 We will provide food, have open Gym Time + Dodgeball and end with some Christmas Treats.